On September 17 the Federal Open Market Committee will announce its decision on monetary policy in one of the most keenly watched US Fed policy meetings of recent times. Since reaching zero (officially 0%-0.25%) in December 2008, the federal funds rate (the US equivalent of the RBA cash rate) has remained unchanged for 53 consecutive meetings. Many market participants are tipping a September rate rise, but the decision appears to be finely poised. Even Australian Treasurer Joe Hockey is hoping for decisive action to normalise US interest rates. For some time, the Fed has suggested rates will start to rise once unemployment has fallen sufficiently, and inflation is moving back towards the medium term objective of 2% per annum. The US economy appears to be continuing its expansion, and recent data suggests we are approaching levels close to that considered as full employment. Consumer spending is rising, and while inflation is still at relatively benign levels, the latest employment report (for August) showed average hourly earnings had increased the most since March this year, and the unemployment rate had fallen to 5.1% (the lowest since April 2008). On the one hand, US economic data is supportive of a rate increase. However, recent financial market volatility, driven largely by gyrations in Chinese and other international stock markets, may give the Fed pause for thought. This is reflected in the market pricing of the potential for a move, with the implied probability of a hike currently sitting at around 33% (with the odds having swung between 20% and 55% over the past month). My personal view is that, just like in the aftermath of Hurricane Katrina (2005), the Fed will look through short-term volatility and increase interest rates by 25 basis points (0.25%). I should note that a hike in September would be the start of a normalisation process, whereas in 2005 the Fed was continuing a tightening cycle, so the hurdle may be higher this time around. The less likely alternative is that the Fed will leave rates on hold once more, but provide explicit guidance as to what will finally end the period of stasis. 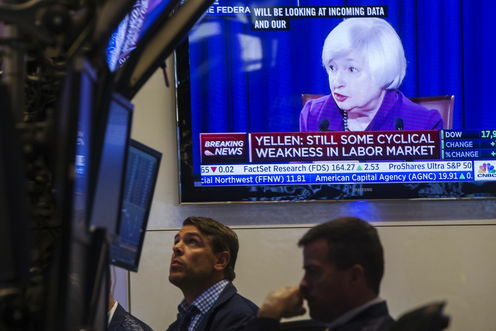 What does the Fed decision mean for Australian financial markets? If the Fed does increase rates, it is likely that the impact on the US stock market will be negative. In their recent book, Johnson and Jensen report a strong association between Fed policy and stock market returns, with stocks performing worst (best) in periods of rising (falling) interest rates. The inter-connectivity of global stock markets would suggest Australian stocks will follow US stocks lower. A Fed on hold would be supportive of stock markets, both US and international, at least in the short-term. Perhaps of equal interest would be the effect on the Australian dollar (AUD). In recent days, the AUD has reached a six-year low against the US dollar (USD), and also fallen considerably against the British Pound, the Euro, and the Japanese Yen. An increase in US rates would serve to reduce the interest rate differential between Australian and US rates even further. This would add to the pressure of slowing demand from China, and falling commodity prices, in pushing the Australian dollar even lower. Recent calls from analysts of an AUD/USD rate close to 0.6000 would edge closer to reality. Again, an unchanged Fed decision may provide some short-term respite to a falling AUD. The global economy is in a delicate position. An unresolved sovereign debt crisis in Europe and falling commodity prices are currently losing the battle for headlines with China’s stock market. As a result, the only certainty appears to be that recent levels of volatility will continue until the Fed’s decision is known. Indeed, if the Fed does raise rates it is likely that any continuation of stock market selling will be accompanied by increased volatility. Ultimately, I expect an end to the period of Fed inaction and a small increase in the federal funds rate following the September meeting. If this does come to fruition, then it’s likely Australian stock markets will move lower, the Australian dollar will continue its fall (alternatively, this may be viewed as the USD continuing to rise), and financial market volatility will increase. Of course, such financial market factors will also feed through into the Fed’s decision. Whatever happens, it may be prudent for investors to be cautious right now.